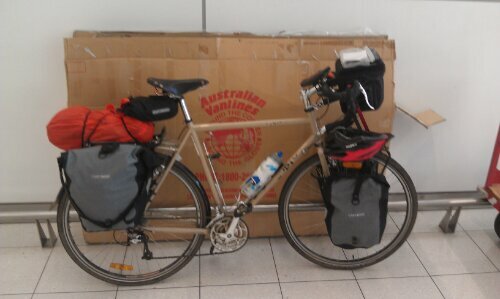 I’m in (R)Adelaide ready for another cycling adventure to start tomorrow. As usual I don’t really have a plan except that I will start by riding south towards Kangaroo Island, and that I will work it out from there. What I do have however is a heavily laden bike and a sense of adventure. These things have seen me through a lot so here is to adventures ahead. Ah, sigh… bon voyage and I so wish I could be joining you! May the sun shine on you, may you always have a tailwine and may the wet stuff stay away! Next time perhaps. Also you forgot to add may the temperature drop from the high 30s.